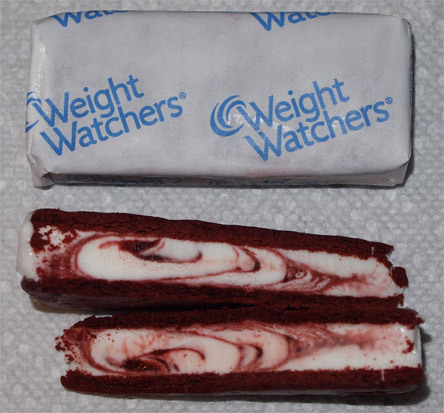 [New for 2013] Part of the free shipment from weight watchers included the very intriguing Red Velvet ice cream sandwiches. I mean, come on, production red velvet products are rare and now to find it in a sandwich? It's the kind of product that could catch anyone's eye (well, if they haven't gotten stuck in the non-lowfat section anyway). 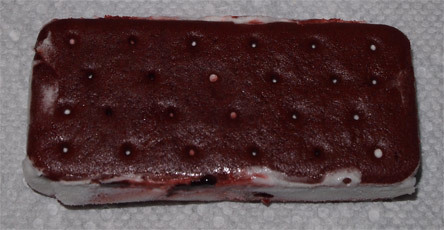 So here they are, a box of 8 "snack size" red velvet ice cream sandwiches clocking in at just 100 calories a piece. The description reads "low fat cream cheese frosting flavored ice cream with a red velvet chocolate swirl between two red velvet chocolate wafers". Cream cheese frosting flavored? I'm guessing that it'll either be super strong or non-existent. I had expected a literal half of a regular sandwich, but instead we have this mini sandwich that maintains the typical ice cream sandwich dimension ratio. Interesting. Ok, so my first experience with these was during a mowing break and they are... something. Ok, I don't really know what to make of them. The wafers keep getting stuck to my dehydrated self and are distracting me from trying to discern the very mellow taste of these. I'm one of those old school people who kind of visually translates the bright color to mean bold flavor, but that's boldness just isn't happening at the moment. I'm getting something but it's such a small treat that I can't make up my mind in just a few bites. We're definitely going to need a second scooping on this one. On Second Scoop Sandwich: Ok, so I just worked my way through two more of these, one together and then one in pieces. There is definitely some kind of red velvet cocoa action going on here. After taking the second one apart, I start to wonder if maybe it's the odd cream cheese filling that's throwing me off more than anything. I know it may not sound like it, but I think these will be a hit. I think the lowfat crowd is going to dig this unique treat. It's just not for me. I thought this was a very disappointing product. In flavor, size, and quality.